Ian Haug is the guitarist in Australian rockers Powderfinger. He's currently locked in a legal battle with a Brisbane casino that allegedly assaulted him, injured his wrist and, as a result, forced him to change his guitar playing technique. Now, we're not going to concern ourselves with the ins and outs of the case, but when an established guitarist is forced to re-learn his trade because of an accident, we should sympathise. Or should we? Ian Haug is not the first, and certainly won't be the last. This is kind of self-inflicted, hence its early inclusion in the list. In 1989, The Who's Pete Townshend impaled his right hand on his Strat's whammy bar when performing the infamous 'windmill' move. While we're on the subject, he also broke several bones in his hand from 'punching a wall' in 1981 and shattered his wrist in 1991 from a bike accident. Luckily, he's still playing fine. RSI (repetitive strain injury) is a common complaint among guitarists and can seriously hamper playing. Radiohead's Johnny Greenwood often wears a wrist support. It seems to do the trick. Dave Mustaine was diagnosed with Carpal Tunnel Syndrome (an injury to the channel in the palm side of your wrist) apparently after 'sleeping on his arm'. The guitarist feared he would 'never play again' although his fears were unfounded: he's still knocking out Megadeth albums now. The former Long Blondes guitarist suffered a stroke aged just 27, but underwent neurological physiotherapy sessions with the help of a 'bionic' hand. Science is amazing. At the age of 18, the gypsy jazz guitarist escaped from a burning caravan with first and second degree burns over half his body. He recovered, and - although the third and fourth fingers on his left hand remained partially paralyzed - so did his guitar playing. He relearned his craft from scratch using just two fingers for chords and, perhaps miraculously, solos. Tony Iommi was working his last ever shift at the sheet metal factory when he lost the tips of the middle and ring finger of his right hand in an 'industrial accident'. 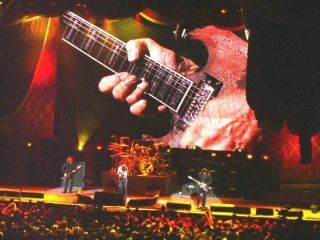 After attempting, and subsequently failing to play right-handed, Iommi put extra-light strings on his guitar, plastic thimbles on his fingers and played through the pain. He went on to (practically) invent heavy metal music with black Sabbath.